Using a trigger joystick you must move your fire-base left and right while shooting bird-like creatures flying at you. Use the segments dropped by the birds to build a bridge across the pit on the right side of the screen to escape and fight Satan. The game features “Flight of the Valkyries” theme music. The game begins at the base of the mountain pass leading to Satan’s Hollow. Players control a combination cannon-bridge-builder, which moves horizontally across the bottom of the screen by means of a Tron-like joystick. The object of the first screen is to build a bridge across the fiery river leading through to Satan’s Hollow, to do battle with Satan himself. Your ultimate foe will not let you through without a fight so he has sent out formations of demonic gargoyles to bar the way. The gargoyles fly back and forth across the screen in tight formations. When you are in really tight situations, press the Shield button to activate a protective aura around the cannon, but it has use of a limited duration. Every time a gargoyle is killed, an angry squawk is sounded off and a bridge segment will appear at the bottom left side of the screen. To pick one up move the cannon over it and it will automatically latch on to it. If it is successfully towed to the far right side of the screen, it forms a segment of the bridge under construction. Although each time a gargoyle is destroyed a segment can appear, it only does so if the previous segment has already been positioned on the bridge. If all gargoyles in the formation are killed, Lucifer, Old Nick or Beelzebub will appear circling above the ground while breathing enormous streams of fire at the cannon. Although the shield protects the cannon against collision and projectiles, it gives very little protection against the huge streams of fire breathed by Lucifer, Old Nick or Beelzebub. When the bridge has been finished, the cannon can cross over the river of fire to Satan’s Hollow on the other side of the mountain where the player finally has a chance to do battle with Satan, who will hurl deadly tridents at the cannon. After the player has destroyed Satan, a bonus is awarded and the game begins again with increased difficulty. 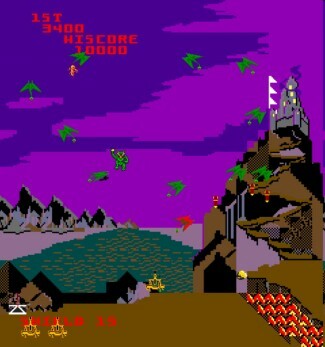 During most of the game, you battle green gargoyles and build a bridge over a river of fire, which you then attempt to cross over. The gargoyles will dive at you and attack with fireballs and explosive eggs. When you shoot a gargoyle, a piece of bridge will appear. Grab it and carry it to the river of fire to slowly build your bridge. Watch out, as the occasional gargoyle will try to capture one of your spare cannons! Shoot it before it gets away to win the cannon back. As you defeat waves of enemies, flags will be placed on the castle. They will come into play when you face Satan. Sometimes, after you destroy all the gargoyles, you will be confronted by either Lucifer, Old Nick or Beelzebub and each of them will breathe streams of fire at you. After you have completed the bridge and crossed over it, you will be face to face Satan who will throw deadly tridents at you which your shield cannot block. After you have defeated Satan, you will get a bonus score based on the flags on the castle, and the game will begin again with increased difficulty.